Introduction — A Southern Ontario vegetable processor utilizes two separate lagoon systems to handle the process water from the plant. One lagoon system recycles the water through the plant for a washing operation and then dumps into the other lagoon for clean up. The other is a once-through lagoon system that contains significant amounts of vegetable matter, which is then discharged to surface water. The lagoons are aerated in all areas, but due to the organic loading in the water there are significant odours coming from the ponds. The odours are bad enough to cause complaints from staff working in the area and from the surrounding community. 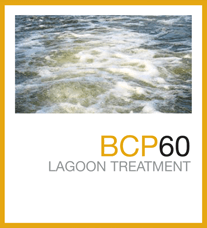 Treatment — The lagoons were treated with BCP60 and STIMULUS to help lower the BOD levels and eliminate the smell. The BOD loading was reduced by almost 98% to a level of 10 ppm in one lagoon in about a week. The other lagoon showed better than 50% reduction in the same time period. Results — The odours were eliminated within 2 days and remained so for the remainder of the treatment period (summer and fall).